Last year we had the “accidental vegetables” when the compost soil we used for plants in the back yard suddenly sprouted tomatoes, squash and other goodies. While it was a total surprise and I’d never grown veggies before R and I decided to research, care for them and harvest the fruit to eat, which we did. This year I decided since it went so well before I should try planting some vegetables on purpose. 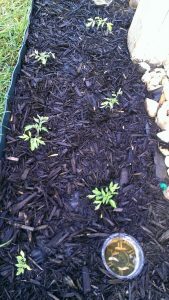 In March I picked up several packets of organic seeds and soil and planted a variety of tomatoes (my favorite), basil and cilantro in pots on the deck. My organic gardener friend (and teacher), Jessie, also gave me seeds for cucumber, tromboncino squash, spinach and another tomato variety. Since all of these are vining vegetables I can create one long row and run them up a trellis together. Last weekend we dug up our section and created the garden. I transplanted the tomatoes and cucumbers, all of which were looking great in pots. I planted the squash and spinach seeds and covered them with clear plastic lids to keep the birds from transplanting them, something the birds in my yard love to do. I put down landscape paper to keep weeds at bay and watered everything carefully (“milk for the babies,” as Jessie would say). The next morning I headed down the steps to see how my precious little life forms were doing. I was shocked to find the baby leaves of the cucumber plants nearly eaten through and slugs milling about my garden happily. I “eliminated” 3 slugs on the spot and then called Jessie for advice. She recommended beer, which most gardeners know already. I took tiny plastic cups, buried them in the soil up to the top and filled each one with cheap beer (I’ll admit walking out of Walgreen’s with a 12-pack of The Beast was actually a bit embarrassing). The second morning I counted 23 slugs in my traps. They were working! But so many slugs! The third morning I had 27 slugs and counting (there were still some milling about which I “helped” into the beer traps). On this day I began to think the price of the beer to maintain this garden might be more than the price of buying some local organic veggies throughout the season! Fourth morning: only about 8 slugs in traps and 2 that needed help getting there, and my cucumber finally looked like it was starting to grow again. Then Jessie sent me this link to a variety of natural methods to control slugs, including copper strips and using a simple board to attract them by day. This article also mentions a product my mother-in-law recommended we try for our carpenter bee problem (a story for another post), diatomaceous earth. Diatomaceous earth (Also known as “Insect Dust”) is the sharp, jagged skeletal remains of microscopic creatures. It lacerates soft-bodied pests, causing them to dehydrate. A powdery granular material, it can be sprinkled around garden beds or individual plants, and can be mixed with water to make a foliar spray. In addition to the Beneficial Nematodes I wrote about for my all natural gnat infestation solution, this insect dust may become another staple in this house. Of course what I didn’t account for is that my slug traps would come under attack by the Bad Dog. Last night it occurred to me that Tinny was taking way too long on her last potty break for the night and it dawned on me why as I stepped outside and yelled for her. Sure enough, she came slinking up the deck stairs reaking of beer and fertilizer. Now… how to control for the largest garden pest yet? !